The "Hot Dog Blog" - Dachshund Breeder AKC Miniature Dachshund Puppies For Sale | Dachshund Hall: Yappy New Year ~ 2014! Yappy New Year ~ 2014! 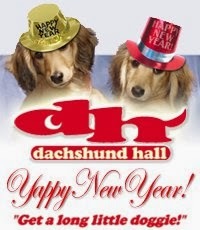 We wish all of our Dachshundhallic friends and family a Yappy New Year! We look forward to sharing our passion for the love of our little four-legged family members with all of you this year and welcoming more of you to the Dachshund Hall family! All of our recent litters celebrated the holidays with their new families... send us those holiday photos! We ended 2013 with the birth of a litter from Paisley & Boudro, born December 26th (all puppies are spoken for). We’ll begin the new year with the birth of a litter from Piper & Hubbell, due January 3rd, see Dachshund Hall - Litter #1. So, if you’re wanting to start the new year with a new puppy, we encourage you to contact us and get on our waiting list. Our puppies always find their new homes quickly.